Hong Kong Trade Development Council - September 26, 2018 - Science parks, utilities and innovators team up to realise smart-city dream. The vision to streamline city management, improve people's quality of life and be a leader in sustainability focuses on six major areas: Smart Mobility, Smart Living, Smart Environment, Smart People, Smart Government and Smart Economy. As identified in the blueprint, the key lies in making use of innovation and technology (I&T). In collaboration with the Chinese University of Hong Kong, we set up the smart region which is a “living lab” for piloting innovative solutions using technologies from the incubates and partner companies in Science Park. Science parks, utilities and innovators team up to realise smart-city dream. Since the local government released its Smart City Blueprint in December 2017, Hong Kong has been on course towards becoming a world-class smart city. The vision to streamline city management, improve people's quality of life and be a leader in sustainability focuses on six major areas: Smart Mobility, Smart Living, Smart Environment, Smart People, Smart Government and Smart Economy. The first 5G innovation lab in Hong Kong purpose-designed with targeted resources to facilitate 5G development. As identified in the blueprint, the key lies in making use of innovation and technology (I&T). Achievements forecast for the next five years were ambitious but have been progressing steadily thanks to collaborative efforts between public and private sectors, and the community in general. 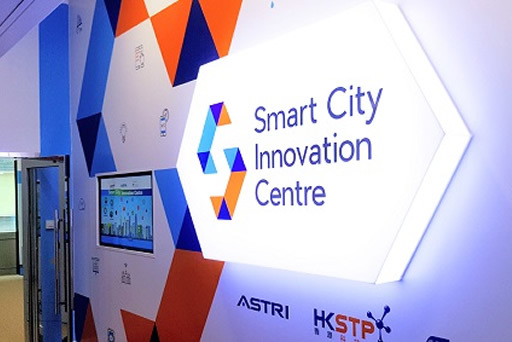 Many of the future technologies necessary to achieve these goals are being developed at Hong Kong Science Park, designated pilot site for the government’s Smart Region. The park is part of the Hong Kong Science and Technology Parks Corporation (HKSTP). Peter Yeung, Head of Electronics & ICT Clusters, Smart City Platform, HKSTP, outlines some of the progress to date. Having established Hong Kong’s first Smart Region, Hong Kong Science Park creates the ideal testbed for pushing forward Hong Kong’s Smart City vision, leveraging Hong Kong’s attributes of dense population, efficiency, world-class ICT infrastructure and high Internet connectivity. Science Park as a living laboratory supports and pilots innovative solutions and the adoption of new technologies. Our data platform provides the gateway to a wealth of machine readable data sets from industry and government, thereby fostering a collaborative platform for the ecosystem and the business sector to share ideas and co-create data applications to deliver socio-economic benefits. Through a concerted approach to facilitate smart city development, we aim to accelerate the development of core enabling technologies, including artificial intelligence, block-chain, cyber security, data analytics, edge computing and create a sandbox for fintech solutions for different types of companies, from start-ups to mid-size finance institutions. “March 2018 marked the launch of our Data Analytics Platform, a collaboration between HKSTP and leading technology partners Siemens, Hitachi Vantara, CLP Holdings, Infineon and NVIDIA to accelerate adoption of smart-city solutions,” Mr Yeung explained. Peter Yeung, Head of Electronics & ICT Clusters, Smart City Platform, Hong Kong Science and Technology Parks. The platform was an extension of the Data Studio launched in February 2017 as a neutral and secured platform for corporations to share data and co-create with the developer community. By 31 July 2018, the Data Studio had attracted more than 7,000 visitors and 760 registered developers who built 832 applications, Mr Yeung said. It housed 283 datasets of various disciplines such as health, finance, environment, education and transport for fostering the development of multiple apps. To advance smart-city concepts, eight multifunctional smart lampposts had been installed in Science Park with Internet of Things (IoT) technologies developed by partner companies. Their function was to collect data on the external environment (such as weather conditions, and pedestrian and traffic flow), provide light-emitting diode lighting, and allow quick-charging for electric vehicles. The Data Analytics Platform launch at Hong Kong Science Park in March 2018. Meanwhile, a number of projects have been conducted at The Sensor Hub, an open platform for testing the latest sensor technologies to improve quality of life, including air, water and weather sensors. The Smart City Digital Hub, designed to accelerate development of smart-city applications and solutions specifically for Hong Kong, had also been active since its launch last December in collaboration with Siemens. “The open lab, consisting of the Smart Mobility Test Bed and Smart Energy Lab, allows experts to carry out R&D to tackle city challenges such as traffic congestion, public safety, energy saving and city planning,” Mr Yeung said. On the green energy front, power company CLP Power Hong Kong Limited (CLP) is introducing the Feed-in Tariff (FiT) Scheme and Renewable Energy Certificates (RECs) on 1 Oct 2018 to encourage the community to participate in renewable energy development. Richard Lancaster, CEO, CLP Holdings Ltd (third from left) with other officials at the signing of the CLP/TUS joint venture. “According to the government’s Hong Kong Climate Action Plan 2030+, it estimated that Hong Kong has about 3-4% of realisable RE [renewable energy] potential arising from wind, solar and waste-to-energy,” a CLP spokesperson said. Chairman Sir Michael Kadoorie led a delegation of senior executives on a visit to Yangjiang Nuclear Power Station in May 2018. With its long-standing track record in building and operating electricity supply infrastructure, CLP is also contributing its expertise via a joint venture with the Chinese mainland’s TUS-Holdings Co., Ltd (TUS). 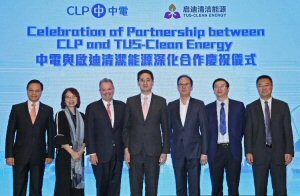 The partnership between their respective subsidiaries – CLP Smart Energy (China) Limited and Beijing TUS-Clean Energy Co., Ltd – aims to develop and deploy new-energy and smart-city technologies amid growing demand for digitalised energy infrastructure and services on the mainland. CLP and the Hong Kong University of Science and Technology jointly hosted an electric vehicle summer programme for secondary students. A CLP spokesperson said the cooperation between the two companies would have a synergistic impact on the development of innovative energy solutions, thus contributing to the evolution of smart-city developments in Hong Kong and the mainland. Initial focus of this partnership would be in southern China, especially the Guangdong-Hong Kong-Macau Bay Area. CLP supports Science, Technology, Engineering and Mathematics (STEM) education for young people. Hong Kong is also showing its capabilities in regard to smart building. Hong Kong-headquartered isBIM Limited (isBIM), a leading building information modelling (BIM) data consultancy in the Asia Pacific, is at the forefront, working with government, leading property developers, architects, contractors and construction education institutes to adopt and implement BIM across various sectors. Anthony Lam, Director, isBIM, explained that BIM could help the construction industry build a smarter Hong Kong: from the design stage where the technology enabled greener, more sustainable and user-friendly buildings; to fulfilling health and safety requirements on site, monitoring progress and identifying efficiencies; as well as facilities management. Mr Lam said an increasing number of developers and architects implemented smart building designs. The visible signs of this included transforming decorative elements into green features such as shading, while advanced sensors on rooftop solar panels collected temperature and sun-path data from the Hong Kong Observatory and automatically adjusted angle and direction to maximise sunlight absorption. “Another innovation being adopted in Hong Kong developments was virtual reality”, he said. “The whole idea of BIM is to transform and digitalise all information and data of a particular building,” Mr Lam said. Such data could be used in various ways – such as simulation, visualisation, optimisation, comparison, monitoring and analysis. “The more building information is gathered and digitalised, the bigger the Hong Kong buildings database will become,” he added. Projects where isBIM has deployed the technology for smarter development include the Hong Kong Science Park phase 3, public housing development for the Hong Kong Housing Authority, the Innovation Tower at Hong Kong Polytechnic University, and West Kowloon Cultural District.